Most of us love a good CAL but what if I share a different kind of challenge? It’s called 18 Before 2018 and it’s a goal setting challenge. 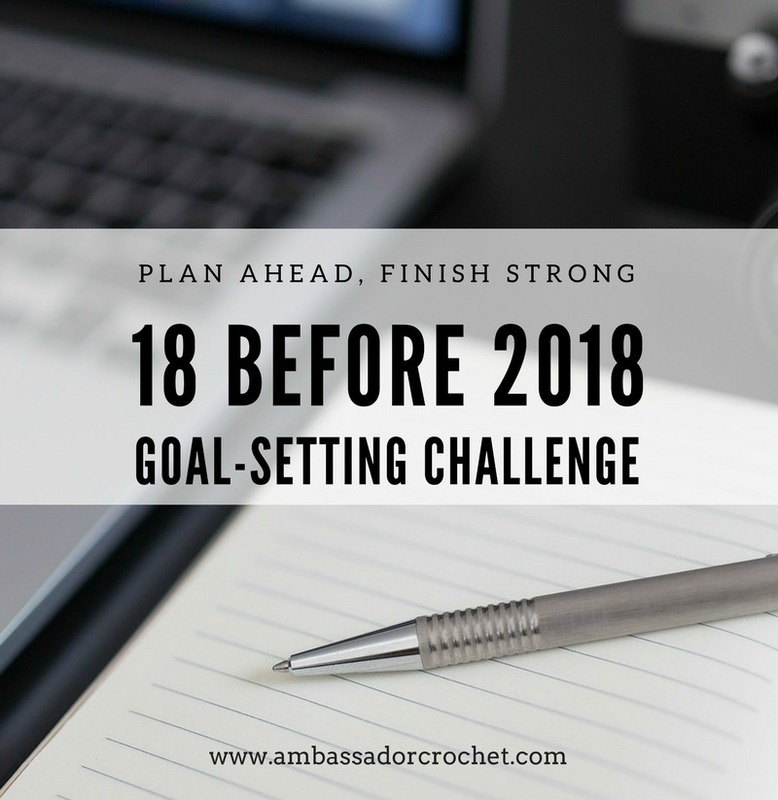 Today I’m listing 18 goals I want to complete before 2018, and I’m challenging you to make a list also. You have until the end of 2017 to complete all 18 goals on your list. This is my 3rd year participating in Lisa Jacobs’ year end goal setting challenge. It’s a great way to get thoughts and priorities in order as the year winds down. My list is a little different this year than normal. I usually focus on all the “things” I need to finish. Tangible things that have a reward. While the majority of my list has those things, it also has less tangible but more rewarding things, like relationships. When I sat down to think about my 18 before 2018 list I really wanted to incorporate my overall yearly goal. 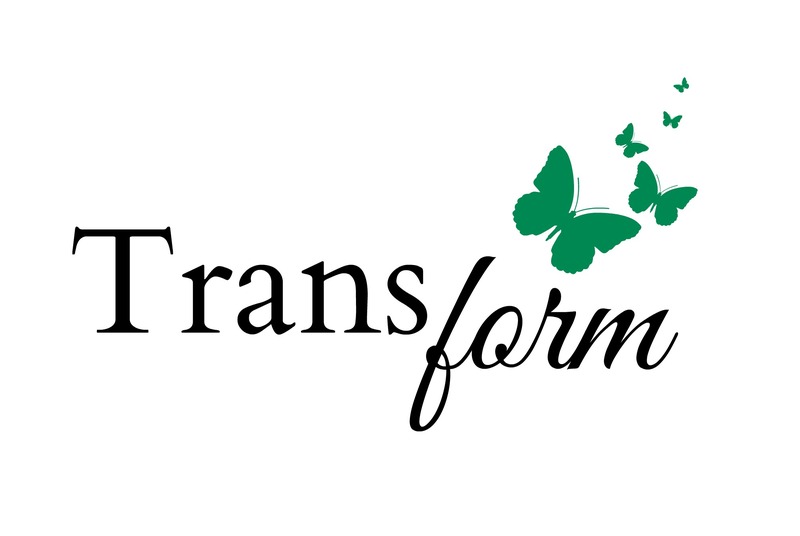 This year my word of the year was Transform. My goal was to transform parts of my life and my business – to see change in everything around me. I wanted to see my business mold and shape into something new and beautiful and to see visible, substantial change – both in my life and my business. I decided after 2016 word of the year – Confidence that it’s time for me to spread my wings and fly. And I have certainly made HUGE progress this year. But the year isn’t over and I’m still not where I had hoped I would be. I do however have 18 weeks left! When thinking about what to put on 18 before 2018 list I chose the things that will have the most impact at the end of the year and I split my list almost evenly between personal and business tasks. 1) Recommit to my blog and subscribers – A couple years ago I recommited to my business, but the one thing that I have struggled with is finding the time to blog. 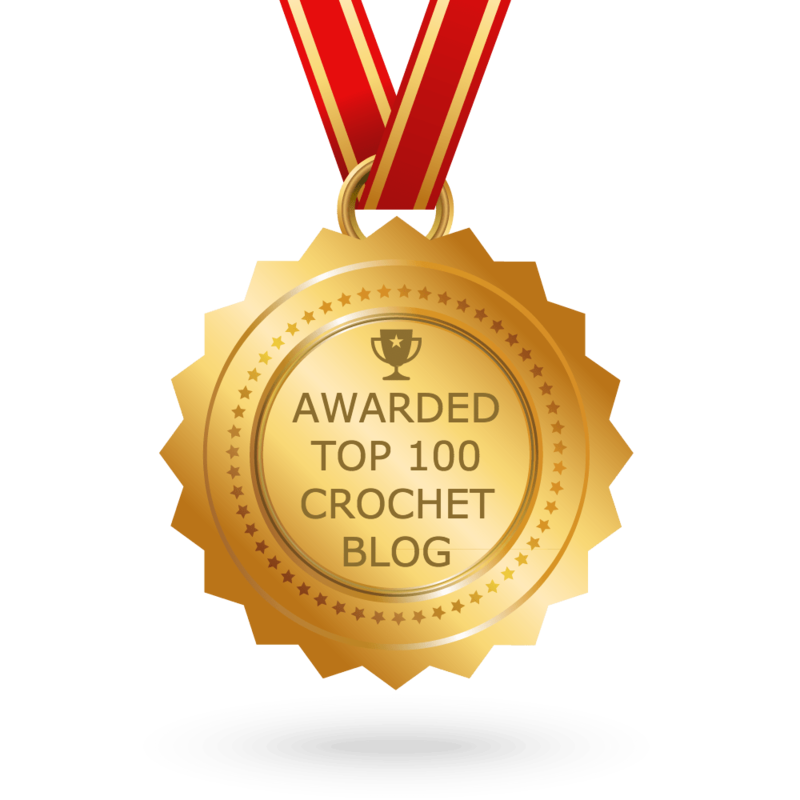 I love teaching and helping others advance their crochet skills, and truly believe a blog format is a great way to do that. I want to transform my blog into a place that crocheters can turn to for help. 2) Create and use an editorial calendar – I will begin to use an editorial calendar for my blogging. I’m getting better about using it to plan out my designs but I’d like to add blogging to it and connect all the pieces. This will help me get a better focus on daily and weekly tasks also. I know it will transform my entire crochet business into one solid unit. 3) Bookkeeping – I always wait until after the first of the year to get all my tax info together. Not this year! I am going to be prepared. I’m committing to getting all my books in order before the end of the year. On next year’s list will be to start from the beginning and stay caught up all year! 4) Plan my 12 Days of Christmas promotion – Last year I did a 12 Days of Christmas sale. I almost cancelled it at the last minute because I didn’t feel prepared. It ended up being the best thing I did for my business all year last year and it wasn’t even about the number of sales! At the end of that promotion I had such a drive to move my business forward and transform it into something amazing! I realized to overcome hurdles you have to take a step forward even if you can’t see where the path is leading. That promotion lit a fire under me to just keep trying and to have faith in myself and my abilities, as well as faith in my business. 5) Publish all my outstanding patterns – I used to have a bad habit of designing something and even writing out the pattern, but then not following through with the pattern testing and publishing part. I made a list of outstanding patterns. By the end of the year I will either have them published or have them ready to incorporate into a collection that is in the planning stages. This will not only will this relieve my to-do list, but it will transform my entire business for 2018. 6) Submit at least 3 patterns to magazines/publishers – I love being an indie designers, but I’m ready to put myself out there again. Most of us don’t like rejection, which is why I haven’t done this in a while. It’s time to spread my wings and transform myself with confidence. 7) Release 1 new pattern collection – I’m trying something new. Instead of just releasing patterns on a whim – like I have done for years – I’m going to try collections. I have some ideas that correlate and mesh well. This is a huge change because now I have to hold off all new releases until the first collection is ready, but in the long row I believe it will transform the way my crochet patterns look, feel, and fit together. 8) Triple my traffic & double my income – My goal for 2017 was to triple my traffic and double my income. I haven’t done my bookkeeping (see #3) but I might get there. As far as tripling my traffic – I’m not even going to come close. If I’m lucky I’ll double it, but even that isn’t guaranteed. What I do know is this – even if I’m not close I’m moving forward and making progress, and I wouldn’t have that drive and motivation if it weren’t for Marketing Creativity. Lisa has put me back on track and kept me motivated. My business has been transformed and I am happy with my progress – even if I don’t get there. 9) Revamp my hours and availability (and stick to them!) – I’m all about helping people. I love the feeling of being able to see them succeed in their crochet, or their pattern writing. But for the last couple months I have been feeling more and more like a few people/accounts seem to take advantage of me – expecting me to answer and respond within minutes, pass their panic on me, and expect hours worth of chat sessions to be free. WOW! Ok, I got it. That was the rude awakening I needed. At that very moment I realized I need to set hours and boundaries – both for my sanity and my business. When I get to a point of feeling like I’m being taken advantage of, something needs to change. In both of these instances recently I was helping with things that were beyond what my services offer (tax questions, video help, basic crochet questions). If they genuinely needed help I should have been charging for my time OR it could have waited. I went back through and in both these situations these people got dozens and dozens of hours free from me (which is my own fault). It’s time to transform my business with some hours and guidelines so it doesn’t continue to happen. 10) The “Hope for Mike” Project – This one is quite personal. I’m calling it the “Hope for Mike” project until we can come up with a better name. The goal is to help my daughter make hats & scarves for the homeless. She’s now on a mission to make hats and scarves for the homeless. Around Christmastime she wants to be able to hand them out so that they will have something for Christmas – something that is handmade with love. I will be posting more on a separate blog post in a few days which will have all the info – but if you’d like to help and donate, please send me an email or a pm on my FB page. Not only has this experience transformed my family , but it will transform many other lives before she is done. 11) Lose 15 lbs + 15 inches – This boils down to getting back in a fitness routine. I have been a yo-yo excerciser for the past couple years – mostly out of fear, but some of it is that I just haven’t been able to make it habit again. In 2012 I was in tears because I had heard more than once “when are you due?” The problem was that I wasn’t pregnant. So, I set out on a weight loss journey. It took me 3 years to lose 30 lbs. – but I did it! Then in 2015 I tore my ACL and had ACL reconstruciton surgery, – which involved removing part of my hamstring and using that as my new ACL. After 7 months of physical therapy I had gained almost 20 lbs back. It was heartbreaking! But I started working out again trying to overcome my fears (for the record I did NOT tear my ACL working out. It was just a freak accident). Not even 6 months into my new yo-yo journey I was out running and ended up with a stress fracture in my ankle. After more than 3 months in an ankle brace I was ok’d to start working out again. Here I am 1 year later and I just haven’t been able to make working out a routine again. I’m now up to 25 lbs I’d like to lose, but I’m starting with a realistic goal. I’m ready to transform my body so that I will feel good again! 12) Drink 75 – 100 oz water every day – Everyone knows your body needs water, but I was very aware that water was one of the key ingredients in my weight loss. It helped me snack less, feel healthier, and lose weight faster. 13) Get my routine set – I know that having a set schedule is the key to being able to get everything done. I’m good about my girls routine, but not so good about mixing the life of a homeschooling mom of 6, with the life of a WAHM, with the life of a dance mom. I feel like I’m scattered and winging it all. the. time. Most days I can get some crocheting and housework done, or school and crochet, or tech editing and a workout, but I always feel like I never know which way I’m going, or what to do next. I want to get my workout in, blog weekly, and keep my business moving forward with things like business training, etc – all while still homeschooling, keeping my house clean, and running my girls to the dance studio every night. Having a plan is key! I believe I can do it all, I just have to make a schedule and make it part of my daily routine. Finish my schoolroom/workshop – Two weeks after we moved into this house I had my knee surgery. So many unimportant things went by the wayside (like unpacking non-essentials). Many of those boxes have been left in a corner of my schoolroom. It’s time to finish unpacking, cleaning off the school shelves and my desk, sell the books we don’t need, and unpack my yarn into the one extra bookcase we have in there. I want to transform it into a fun place where we school, laugh, work, and have fun. Right now it just causes us stress because it’s an overcrowded mess. De-clutter my daughters’ bedroom – My 3 youngest girls share a bedroom….and it’s an overcrowded mess. Time to get rid of clothes they don’t wear and toys they don’t play with. I did the Kon Mari method in their room a few years ago. I think it’s time for that method again! Master bedroom – organize and finish unpacking. 15) Make something amazing for my girls for Christmas – My girls always get something from me for Christmas, but this year I would love to knock their socks off with something extra special. 16) Have game day – I want to have game day 1 or 2 times a month with the kids. Hubby and I make it a point to have pizza and movie night with the kids once a week. We don’t watch TV any other time (other than the race on Sunday), so this is the one or two times a week we turn the TV on. It has become not only a treat, but our family time. I love our family time, but I’m ready to add in some interaction! 17) Truly let go – I have hung onto some things/people for far too long. I’ve tried to let go but haven’t truly been able to because I was really hoping to patch things up and continue the relationships. It’s time I find a way to let go once and for all. You become like the 5 people you spend the most time with and I’ve come to the realization that I don’t want to be like these women, plain and simple. I’ve also realized I’m setting an example for my children with the kinds of relationships I have pursued and it has made me look at it from a different perspective. I’m ready to find a way to let go so that it doesn’t bother me anymore. 18) Have a plan going into 2018 – I want to have all of 2018 planned out by the end of 2017. Not that it needs to go as planned – I just need to start with the plan. For many years now I have hesitated doing something until I think it can be executed perfectly. But what ends up happening is 90% of the time I don’t follow through because the perfectionist in me always says, “It’s not perfect yet” or “That’s not good enough yet.” I just need movement. It’s time to set the wheels in motion and then I can change direction later if I need to. I used to be a major planner. Then I had 5 girls in 8 years and planning kind of went out the window. But do you know what I have learned? Much of what we want to accomplish needs to start with a plan that can later be adjusted, but not until but not until after that plan is set in motion. It’s time to put myself out there and not care about what others are thinking. I am so charged to work on my list! At the end of the year I will be ready for 2018 and excited about all I have accomplished. If you’re looking for some ideas, you can check out Lisa’s blog post 18 Before 2018 where she has some prompts and things to help you succeed with your list. Believe it or not the end of the year is right around the corner! So many times, the year comes to a close and I wish I had finished or done way more than I have. Don’t let this year end that way! Here’s to Ending 2017 Strong!